The Honda Civic Hatchback Prototype is set to make its North American debut on March 22, in advance of the 2016 New York International Auto Show. This highly anticipated prototype showcases the aggressive styling of the 2017 Civic Hatchback, which is launching later this year. This will be the third new variant of what is considered the sportiest Civic lineup ever, whose options include the 2016 Sedan and Coupe, as well as the upcoming Civic Si and radical Civic Type R.
The Honda Civic Hatchback Prototype’s looks are sporty and aggressive, with a major influence from European hatch styling. It features Honda Turbo engine technology, the handy utility of a hatchback, and an impressive lineup of premium features and class-leading safety technology. With the production model launching late in 2016, everyone in Civic Nation will be anxiously awaiting the return of an icon – the Civic Hatchback. Stay tuned to Hamilton Auto Blog for more updates on the expanded Honda Civic lineup. To view out current Civic inventory, please visit www.imagehonda.com. The 2016 Honda Civic Coupe is coming soon…and we can’t wait! The all-new 2016 Honda Civic Coupe made its Canadian debut at the Montreal International Auto Show, and it was a showstopper! The newest addition to the Civic lineup features an abundance of upgrades including a new sporty, sophisticated chassis and a roomier, quieter cabin. The Civic Coupe will arrive at Image Honda later this spring, joining the 2016 Civic Sedan. Like its sedan counterpart, the Civic Coupe will feature two advanced new engines, including the first-ever 1.5L turbo engine for the Coupe, delivering more power, performance and fuel efficiency. The trim lines, from the well-equipped LX to the all-new Touring, receive significant upgrades to interior style, with soft-touch materials and high-grade finishes. Technology and safety are a priority, with standard and available features, including the Honda Sensing™ suite of safety and driver-assistive technologies as well as both Apple CarPlay® and Android Auto™. The 2016 Civic Coupe is the second in a series of new 10th-generation Civic models that Honda is launching over the course of 18 months, including the Civic Sedan, Civic Coupe, the 5-door hatchback and Civic Si performance variants. And for the first time in Canada, the radical new Civic Type-R will be available (can we all say “Squeeeee!” about that one – it will be AWESOME!). The 2016 Civic Coupe sports the premium character of the 10th-generation Civic design, including the bold front fascia, fast-back profile and sharp-edged detailing. The new Coupe also benefits from a lower seating position, which amplifies the Coupe’s low and wide dynamic driving character. It also features an exclusive rear taillight design is distinctly C-shaped, with LED taillights across the full length of the rear deck lid. The 2016 Civic Coupe’s sportier design does not come at the expense of passenger comfort, boasting 222L more interior space and 130 mm more rear legroom than the outgoing Coupe model. The new Civic Coupe interior has premium touches, with high-quality materials and high-contrast finishes. These include a new one-piece, soft-touch instrument panel with molded stitching; more premium seat fabrics; door inserts with real stitching; an LED shift indicator and LED overhead lighting; and for EX and higher trims, a leather shift lever boot. New standard equipment includes full-colour TFT centre meter, seven-inch Display Audio touchscreen, auto on/off headlights, LED daytime running lights, LED taillights, acoustic glass windshield, automatic climate control (dual-zone in upper trims), Electric Parking Brake with Brake Hold and Walk-Away auto door locks. New available features include Honda LED headlights, Remote engine start and rain-sensing wipers. The 2016 Civic Coupe provides the latest in audio and connected-car technology, including more powerful audio systems; a standard new Android OS-based, 7-inch Display Audio touch screen interface; a wide selection of streaming audio options such as SiriusXM® and HD Radio™; and full compatibility with both Android Auto™ and Apple CarPlay® platforms. The Civic Coupe’s highest trim will also feature a new Honda Satellite-Linked Navigation System™ developed in cooperation with the experts at Garmin. Looking for power and fuel efficiency? The 2016 Civic Coupe delivers, with two more powerful and fuel-efficient powertrains. Lower trims receive a new 2.0-liter DOHC i-VTEC™ engine, with 158 horsepower and 138 lb.-ft. of torque and can also be equipped with a 6-speed manual transmission. Civic Coupe mid to highest trims are powered by a new 1.5-liter DOHC direct-injected TURBO – the first-ever turbocharged engine for Civic Coupe – putting out a peak 174 horsepower and 162 lb.-ft. of torque. This engine is exclusively mated to a Continuously Variable Transmission with paddle shifters for the Canadian market. Safety has always been Honda’s number one priority and the 2016 Civic Coupe is no exception. It utilizes Honda’s next generation Advanced Compatibility Body Structure™ (ACE™) working in conjunction with advanced airbags and seatbelts to provide a high degree of safety performance. Utilizing these with the available new Honda Sensing™ suite of advanced safety and driver-assistive technologies, the 2016 Civic Coupe with Honda Sensing™ targets the highest available U.S. safety ratings – an NCAP 5-Star Overall Vehicle Score from the National Highway Traffic Safety Administration (NHTSA) and a TOP SAFETY PICK+ rating from the Insurance Institute for Highway Safety (IIHS). The 2016 Honda Civic Coupe is set to arrive at Image Honda later this spring. 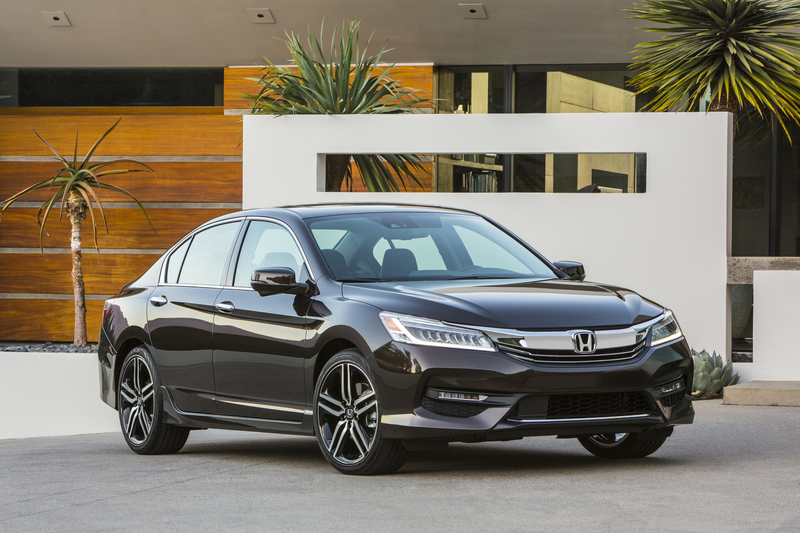 Follow Hamilton Auto Blog for more exciting details on Honda’s 2016 lineup. After a brief hiatus, the Honda Ridgeline is back, delivering superior driving dynamics with the largest interior space offered in a mid-size 4 door pickup. Revealed in Detroit on January 11th at the North American International Auto Show, the Honda Ridgeline sets new benchmarks for versatility and comfort. Class-exclusive features – In-Bed Trunk, dual-action tailgate and the industry’s first in-bed audio system. Available Honda Sensing suite of Safety and driver-assisted technologies. The new design, based on Honda’s Global Light Truck platform, has a rigid yet lightweight unibody construction, with fully independent suspension. As such, it helps to deliver an excellent ride with even better handling. Powered by a 3.5 litre, direct-injected, i-VTEC V-6 engine with automatic transmission, the Ridgeline provides segment-leading EPA fuel economy ratings. For the first time ever, we are excited to announce that the Ridgeline will be available in both front wheel and all-wheel drive. On the interior, the 60/40-split and folding second-row seats not only provide convenience, but give you the versatility that you need. When folded down, the truck can comfortably seat 5 passengers while still accommodating larger items that can be stored under the seat such as a golf bag. If you’re looking for the convenience of hauling large loads, the truck bed on the Ridgeline is like no other. At 5’ wide and 5’4” long, the 2017 Honda Ridgeline is the only vehicle in its class able to offer 4-foot wide flatbed space. Additionally, the composite of the bed is UV-stabilized and scratch resistant and comes with a dual action tailgate, available 400-watt AC power inverter and the industry’s first in-bed audio system. With so much excitement surrounding the 2017 Honda Ridgeline, you’ll want to be sure to follow us at Hamilton Auto Blog for the latest updates. As always, please stop by and visit us online at Image Honda or in person. How does Honda Canada celebrate its seven-millionth Honda vehicle built in Canada? Well, they donate it of course! The grey 2015 Honda Civic EX sedan was given to the Annual Rally for Kids Cancer fundraiser for live auction, with 100% of the proceeds being donated to the Sick Kids Foundation! For more information on the Annual Rally for Kids Cancer Fundraiser, click here. Stay connected and up to date with Hamilton Auto Blog for the latest Honda news and for ways you can help our community through special projects and initiates. If you haven`t had the opportunity to view and test-drive the all-new Honda HR-V, now is the time to do so. In addition to its stunning appeal, advanced technology and affordable pricing, the new 2016 Honda HR-V has just received a 5-Star Overall Vehicle Score, the top score available in the National Highway Traffic Safety Administration (NHTSA) New Car Assessment Program. As an entry crossover, the HR-V also achieved an IIHS Top Safety Pick Rating from the Insurance Institute for Highway Safety. With multiple standard and available safety features including SmartVent Front Side Airbags, Side Curtain Airbags with Rollover Sensor, Lower Anchors and Tethers for Children (LATCH), Vehicle Stability Assist with Traction control, Motion-Adaptive Electric Power Steering, Anti-Lock Braking System, Honda LaneWatch (EX, EX-L Navi), Hill Start Assist, Expanded View Driver`s Mirror, Multi-Angle Rearview Camera with Guidelines, Forward Collision Warning and Lane Departure Warning (LWD) (EX-L Navi) it`s no wonder this vehicle received such a high accolade. Without a doubt, this is one Honda vehicle you must experience. Visit us at www.Imagehonda.com to schedule a test drive or stop in and speak with one of our reputable sales consultants. As always, stay connected to Hamilton Auto Blog for the latest news at Image Honda.